The former home of Thomas M. Pendleton which is located on ground that was part of the original town plat. Headquarters of the South Madison Community Foundation. Fall Creek is the third largest township in Madison County. Only Monroe and Pipe Creek townships are larger. It is six miles from east to west and seven miles from north to south, making it 42 square miles. The township derived its name from the principal waterway, Fall Creek, that flows in a general southwesterly direction, traversing the width of the township for a distance of roughly eight miles. Fall Creek is one of the original five townships created by the county board between 1823 and 1829, and, like the other four, the actual date of formal organization is unknown. No doubt the area, known to many as The Falls because of where the creek takes a nine-foot plunge over solid rock, had been visited many times prior to settlement by white men seeking game for food or fur. But the credit of being the first settler in what became Fall Creek Township, or for that matter anywhere in Madison County, goes to a tall, raw-boned Irishman named John Rogers. He arrived in the area from North Carolina on December 29, 1818, and settled on a tract of land about a mile and a half east of today's town of Pendleton on the south side of State Road #38. Although it's hard to imagine today that he would have undertaken the journey at that time of the year - when weather would have exacerbated already poor and difficult travel conditions - his arrival was found recorded in a book in Mr. Rogers' own handwriting substantiating his date of arrival. The lands had not yet been surveyed, but he went about clearing his land preparing for a crop the following spring. Shortly after, a United States survey was made of his land revealing the actual property boundaries. Realizing that he did not like part of the ground on which he had settled, he moved a few hundred yards to the southeast where he recorded a farm on which he lived until 1838, when he sold his land to Abraham Vernon and moved to Iowa. In 1820, eight men came from Clarke County, Ohio, to The Falls with the purpose of establishing homes. Seven were married: William Curtis, Israel Cox, Thomas and William McCartney, Saul Shaul, Manly Richards, and Elias Hollingsworth. The eighth, Moses Corwin was unmarried. Mrs. Hollingsworth came with her husband and was most likely the first white woman in the county. Their son, E. P. Hollingsworth, born November 7, 1820, was the first white male child born in the township. And, in the evening of the same day, Electa Shaul became the second child, and first white female child, born in the township. After choosing lands on several sites surrounding present-day Pendleton, and perhaps erecting a very basic shelter, the married men returned to Ohio to bring their families. Manly Richards is the only one to not settle with the original group as early election records show him living in Adams Township. Other settlers soon followed, including Thomas M. Pendleton. Although the exact date of his arrival is unknown, it can be assumed that he arrived before June 3, 1823, because it was on that day when he purchased and recorded his land at the home of William McCartney - land that was to later become a town bearing his name. A large percentage of the first settlers of Fall Creek Township located at and near the falls on Fall Creek, and the density of the population gave the locality the appearance of a town; but, Mr. Pendleton was the first to conceive the idea, or take steps toward founding one. In 1821, Thomas McCartney erected a crude corn mill to grind grain into meal. Thomas, along with his brother William, also operated a small store. Undoubtedly, all who ventured there to have their grain ground or secure needed goods at the McCartney brothers' store called the place by the name familiar to all as The Falls. When state legislators met at Corydon the first Monday of December of 1822, an act was passed granting county pioneers the right to organize a separate jurisdiction for administration of affairs. 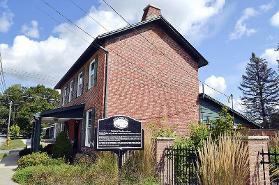 County business was done at the home of William McCartney, where the county was formally organized November 10, 1823. The house was constructed of logs and situated on a lot later occupied by the Universalist Church. The earliest courthouse in the county was built on the west side of the North Main Street of Pendleton. On January 13, 1830, Thomas Pendleton had the same land which he recorded June 3, 1823, surveyed and divided into town lots, thus officially establishing the name of Pendleton, even though it had been commonly called by that name for some time. Twenty-seven years later, on October 12, 1850, the original plat was re-surveyed and corrected by Col. N. Berry, at which time two or three additions were made. On December 24, 1853, a vote was taken to determine whether Pendleton should be incorporated as a town or remain a village without any organization. Forty-one votes were cast with thirty-seven being in favor of incorporation. One more place name is associated with Pendleton and is reflective of the period when the town was the county seat of Madison County. On May 4, 1824, the United States Post Office officially opened for business there with Moses Cox appointed as postmaster. The office functioned under the name Madison Court House until it closed on October 31, 1826. Located on the north bank of Fall Creek and only a short distance upstream from Pendleton is Huntsville. The town derived its name from one of the first settlers, William Hunt. At one time it was a flourishing village and was a rival with neighbor Pendleton. Huntsville was laid out on May 24, 1830, by Eleazer Hunt and Enos Adamson. Within a few years a spirit of rivalry with Pendleton began to manifest itself. With the arrival of the Bellefontaine Railroad in 1850 at Pendleton, the differences were set to rest as both towns had courted the railroad and the prosperity its arrival promised. With the railroad's choice of Pendleton, business in Huntsville declined. An examination of Fall Creek Township will continue when the focus will be on the place names of those communities that have added so much to the township's rich history and a few that have faded away. Stephen T. Jackson, Madison County Historian.